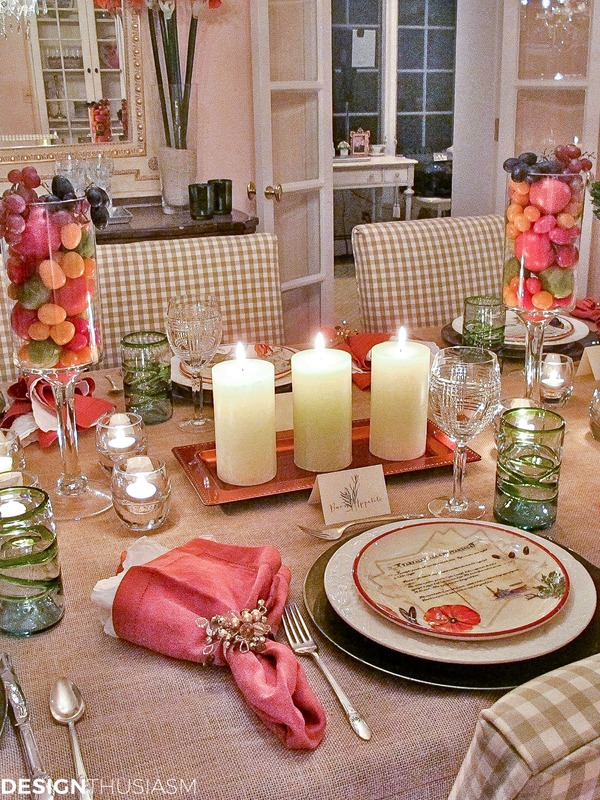 In this post: A great way to add color to a table is to decorate with food. 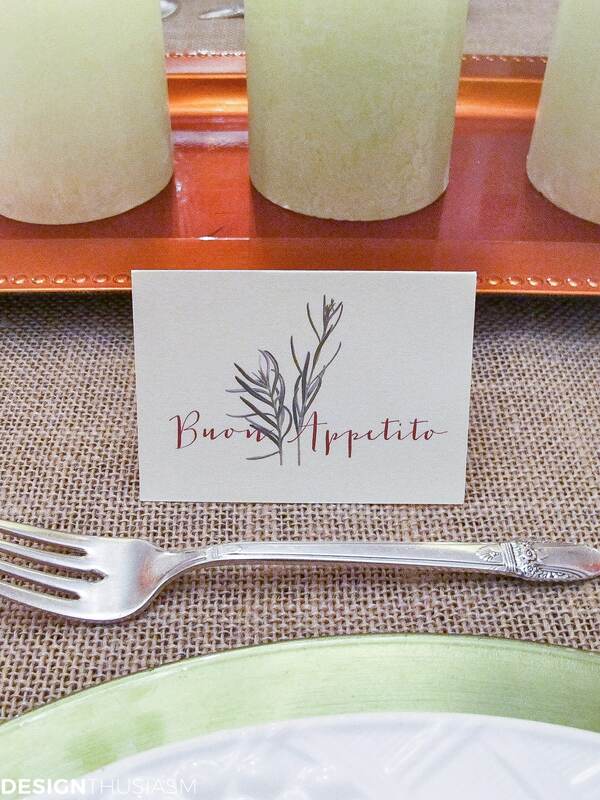 These simple Tuscan tablescape ideas are perfect for an Italian themed party. The inspiration for this setting came from two places. First, was our upcoming trip to Tuscany to visit our daughter who’s studying there and, second, was the Italian recipe salad plates that we had received as a gift some time ago. I initially had only four of the plates and they were no longer available from the store, but when I decided to build the setting around them, I took to eBay in a successful search for the remaining place settings. As always, I started with one interesting element and built a color story and details around it. I never use place cards to seat my guests at an intimate dinner because I prefer they choose their seating, but I love the opportunity to use printed graphics on the table, so I designed these table cards as a fun detail to further communicate the theme. 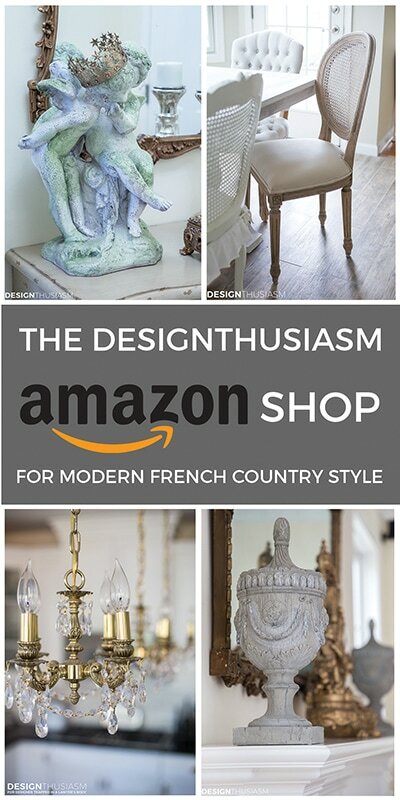 The pair of floral arrangements are housed in distressed Tuscan inspired urns. Orange roses and red dahlias team up with greenery to tell the story of the Italian countryside through color. 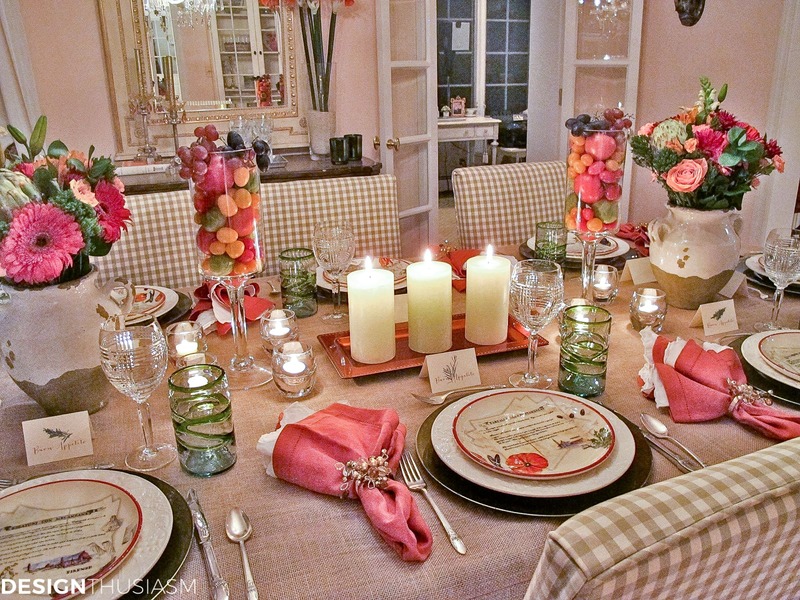 The glow of candlelight enhances the warm tones of the tablescape and the surrounding rooms. The glimmer of the glassware and crystal help lend the dinner a sense of elegance that plays off the more simplified country elements. Decorating with food is always a favorite of mine. Here, glass hurricanes are filled with varied tomatoes and grapes, another nod to the Mediterranean fare widely available throughout Italy. The long view from the table opens into the neighboring living room where drinks are served before the meal. No Tuscan meal is complete without Limoncello and Italian pastries. 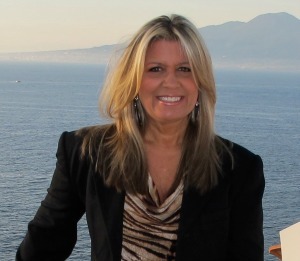 Oh I so loved Italy, my husband and I were there for 2 weeks. I was with him on business, but in the evening and weekend it was so wonderful to enjoy the Italian atmosphere. Your tablescape makes me want to go back again. The flower arrangements are so beautiful. Tuscany is such a relaxing and beautiful place. I hope you enjoy your trip. Beautiful table, Lory! 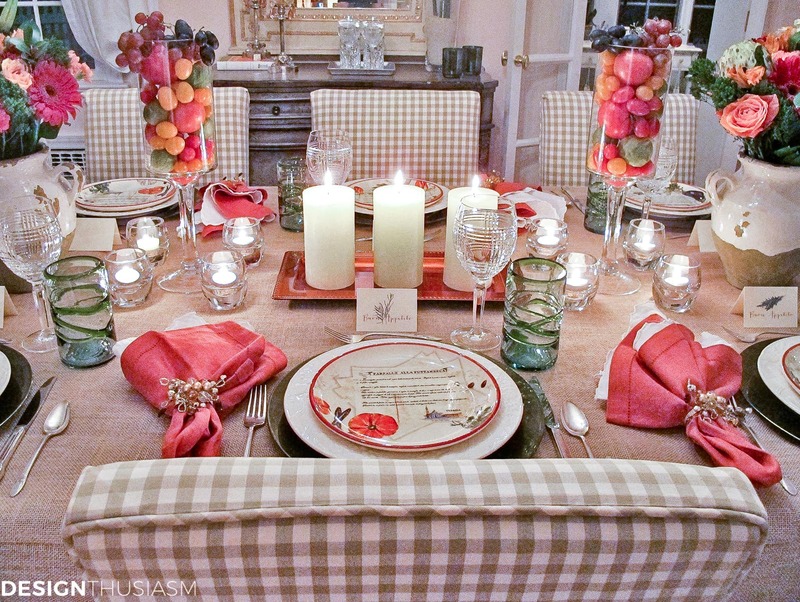 Love the Tuscan theme that you so beautifully executed; and the Ralph Lauren Glen Plaid glassware is a fave of mine. It’s my hubby’s favorite glassware to use. Love the plates from Williams-Sonoma, as well. I love their dinnerware choices! Thanks so much Shenita! 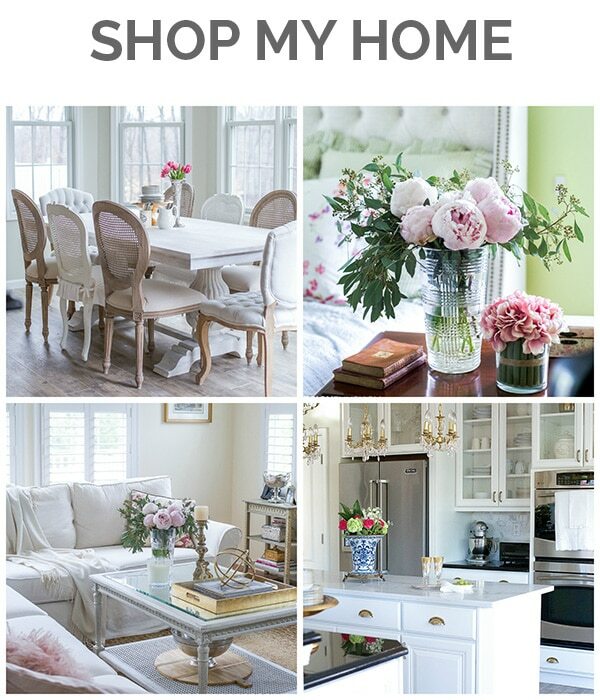 I’m new to this whole blogging thing, but it doesn’t take long to figure out who are the like minded bloggers and I can see from what you post that we share similar taste in home style… 🙂 I love the way you characterize your style, because I too would use many of the same terms. Thanks for visiting! The table looks very pretty and the food looks amazing! Lory if my arthritic knees would allow it I’d be jumping up and down at the sight of this gorgeous table. You definitely set the mood with this one. 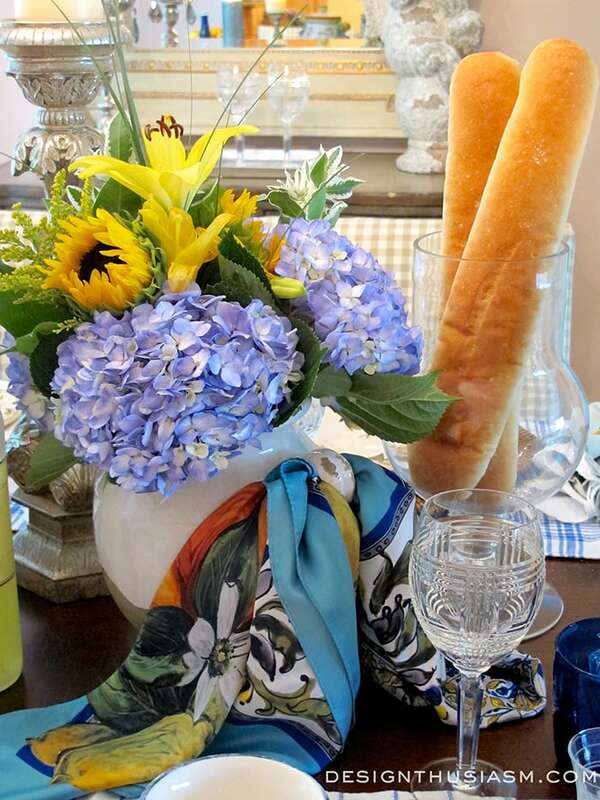 My daughter is taking a cooking class in Florence this month and my intention was to do an Italian themed table. Thank you so much for the inspiration! Aw Sandra, thanks for that visual (jumping up and down… ;-))!! Yes, I’m a big Italophile. A cooking class in Florence sounds fabulous! One of my daughter’s classes was “Pairing food and wine”. School wasn’t like that when I went! Your Tuscan table is stunning. I’ve never been to Italy but imagine such wonderful sights and sounds as these. I love all the special touches you added to continue your theme…it’s lovely. Hi Lory, a woman I can relate to. your table is so welcoming and warm. 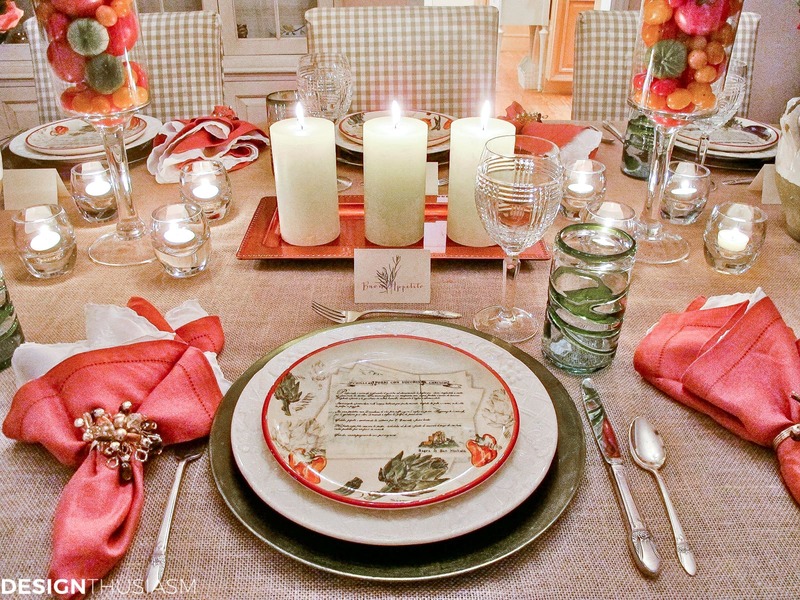 Love your details, place cards and fruits and veggies. I love a large long dining table. We have one too. We hope to visit Italy in the near future. So many wonderful places to see. I shall spend the time browsing through your lovely pictures. Thanks so much Linda! Enjoy your visit… 🙂 If you go to the Travelfolio category, you can see some of my pics from the trip. This is delightful. I’m one to study every detail and everything you have done is beautiful. I love the different colors of the walls in the 3 rooms I can see. I would love to see Italy someday till then, thank you for sharing this inspiring table. Oh my, the whole thing is stunning! I love your dining room, the gorgeous table with lovely dishes and great elements and yummy food…what can I add, but perfection! I tried following you, but couldn’t find the link. Thanks for coming by, I loved it! Thank you so much Fabby! Is my “follow link” not working or could you just not find the button? It should be right on my home page to the right of the posts, right below the social media buttons. 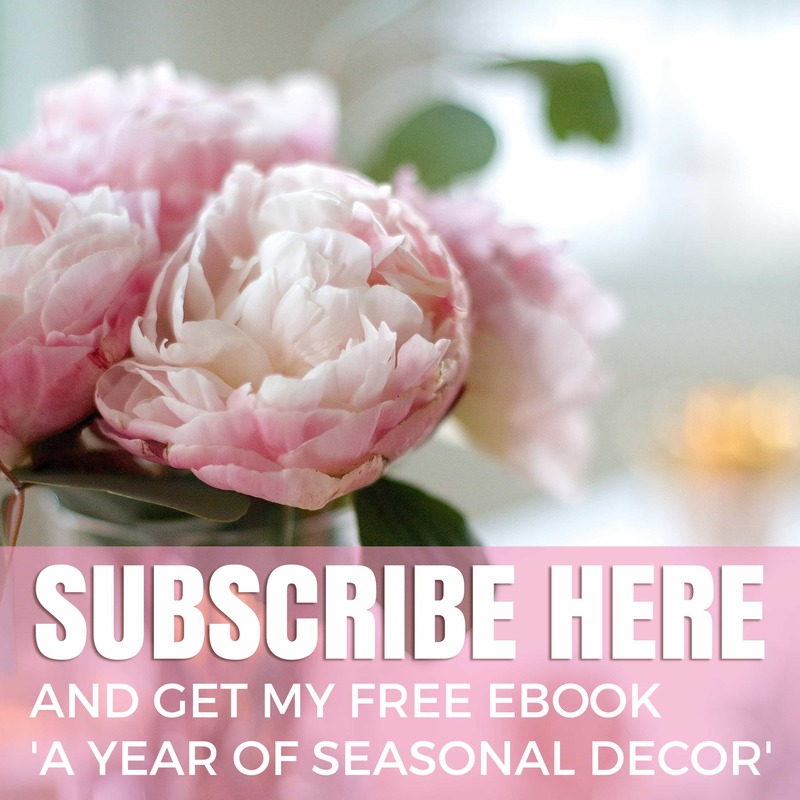 There’s a subscribe by email button, but there’s also a “follow me on bloglovin” button which is the easiest way. Thank you so much for following (or at least trying to)!! Thanks Jenna! I agree about the language thing. I barely speak any Italian, but my French is good enough that I believe if I lived in a French speaking country for 6 months, I’d be fluent. Always thought that would be so cool! Oh wow, I love the tablescape. 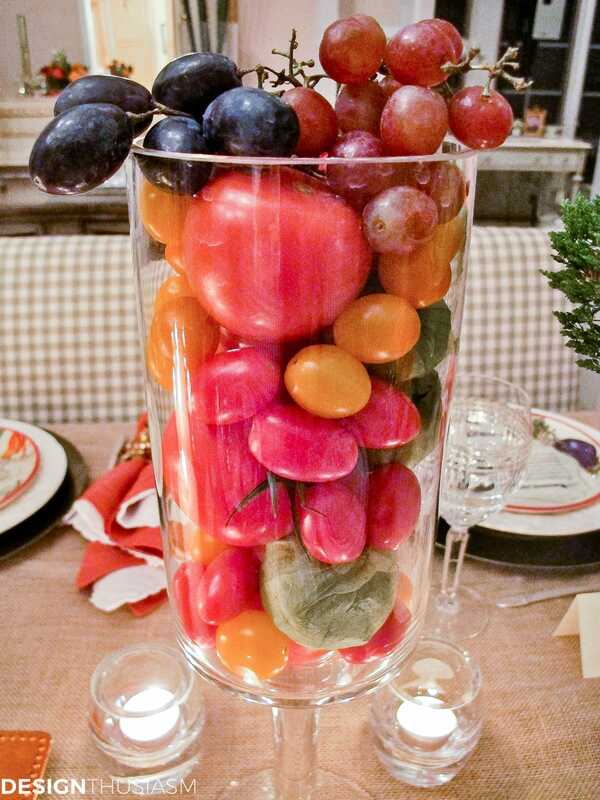 Using the tall apothecary jars to hold fruit is such a wonderful idea. Everything looks so beautiful. 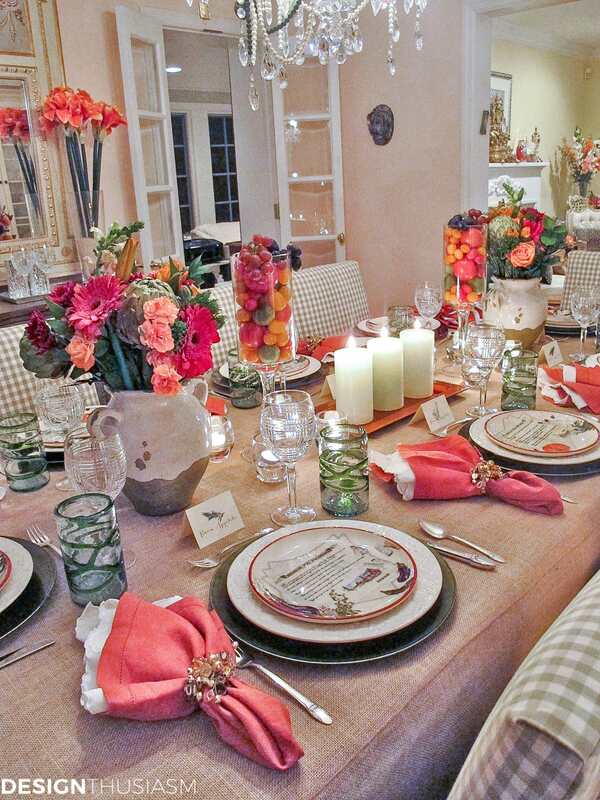 I also really love the checks and the coral colors in the room. Stunning. What a lovely table. It certainly transports one to Tuscany. It is a great table to enjoy a delicious meal with friends. Thanks for visiting me. Your kind words are appreciated. You had me at Lemoncello! Gorgeous Lory…..just gorgeous! Lovely table! 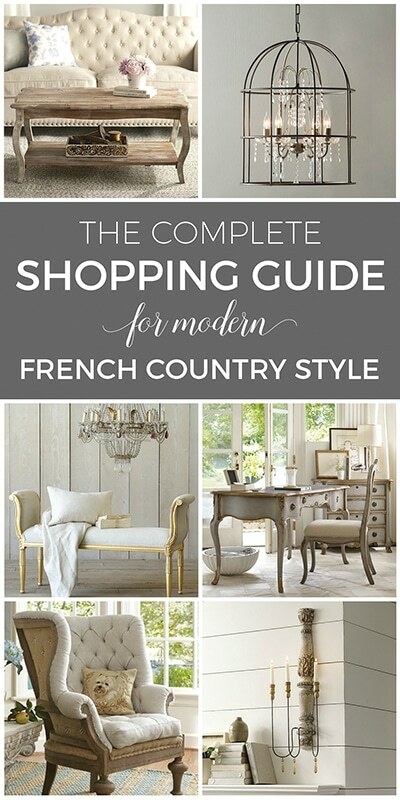 I love the beige checks, and the burlap table cover grounds the whole table beautifully. 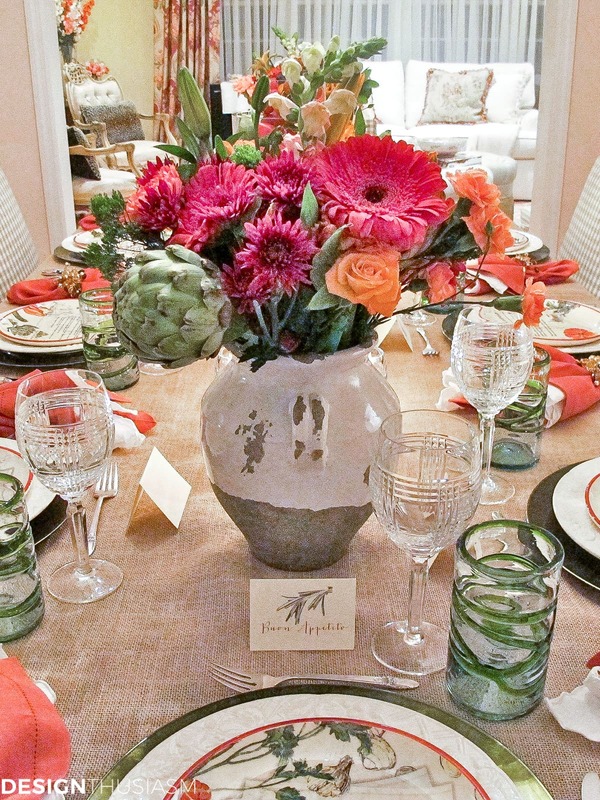 The terra-cotta napkins look fabulous with the salad plates. Beautiful! 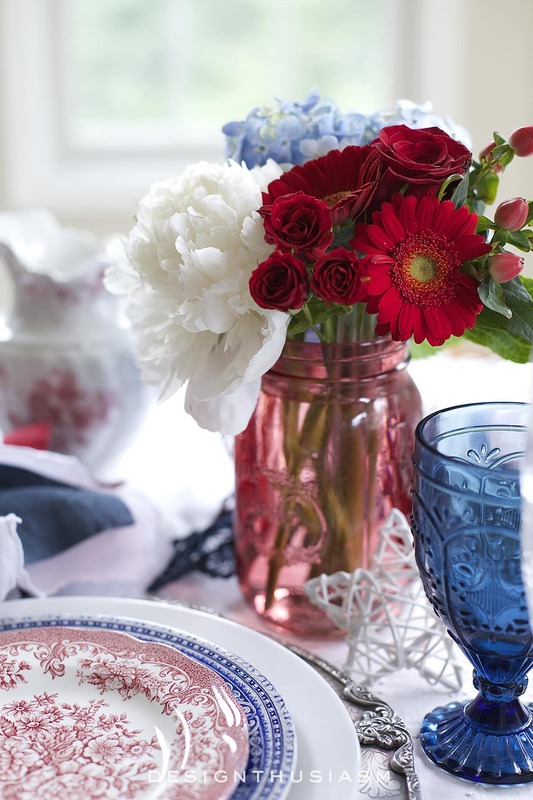 Your table setting is absolutely beautiful. My favorite thing is the collection of the colorful little tomatoes in the glass cylinders. That was a charming idea, instead of just all flowers. The whole thing is just pulled together beautifully. Thanks for sharing and enjoy your trip to Tuscany! What a lovely place to be! that dining room setting makes me want to be a better person. I must get at least one room finished soon. What a great table that beautifully captures the warmth of Tuscany. I can’t tell you what I like best. Maybe the flower arrangement. No, the hurricanes filled with fruit or maybe the flatware. It’s all terrific. 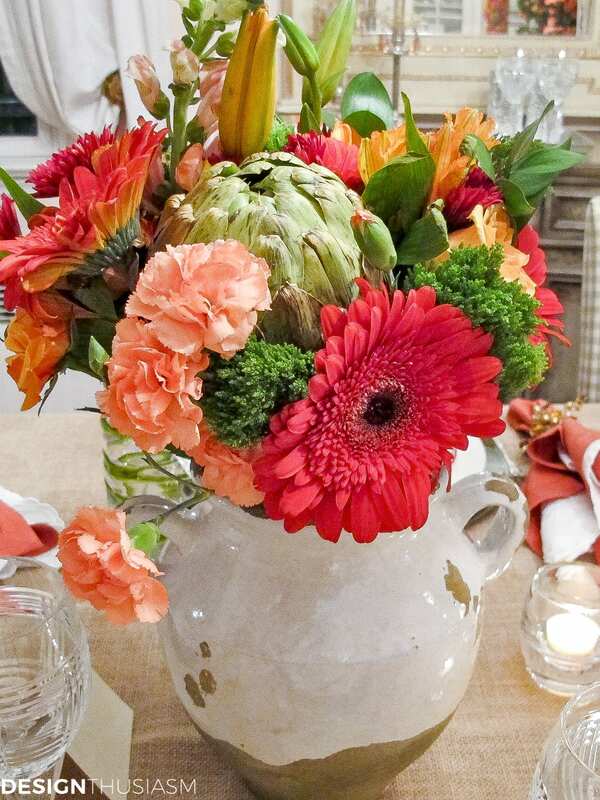 Perfect coloring for a Tuscan themed table! I definitely like the hurricanes filled with fruit! 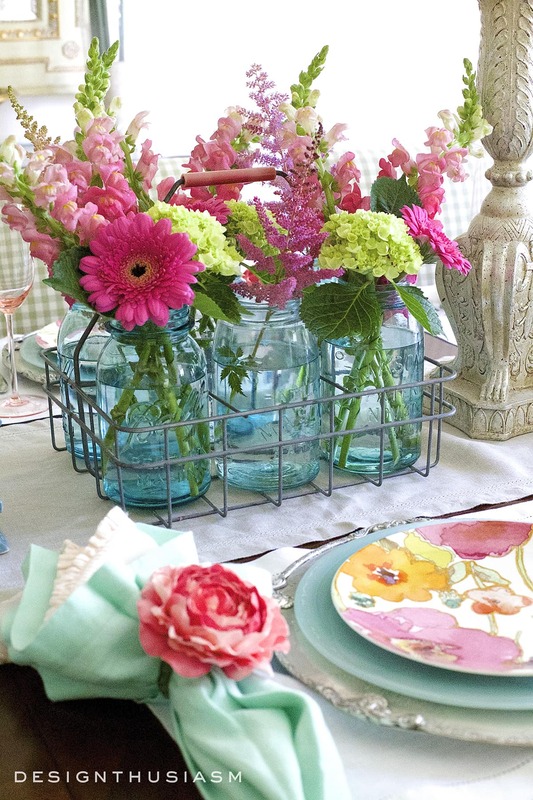 The PB vases with flowers have the perfect aged look that goe so well with this theme. Those are great plates- don’t you love how Ebay can help save the day! Love the printed table cards! Thanks and it’s my pleasure, Rosie!! Lory, your table is gorgeous. 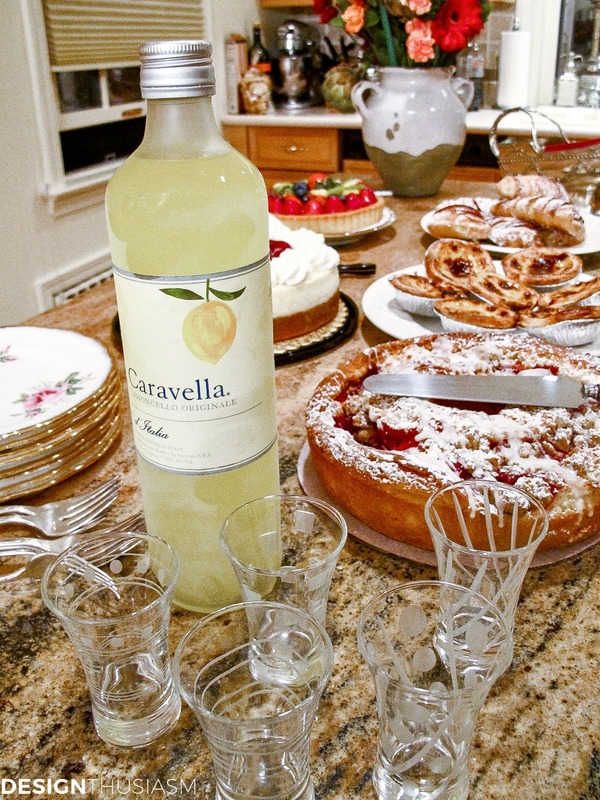 Love the Italian pastries and the Limoncello pictured in your desert section. Is that a Gubana cake? We always bring back that cake from the Friuli region when we travel through Italy. Just beautiful!